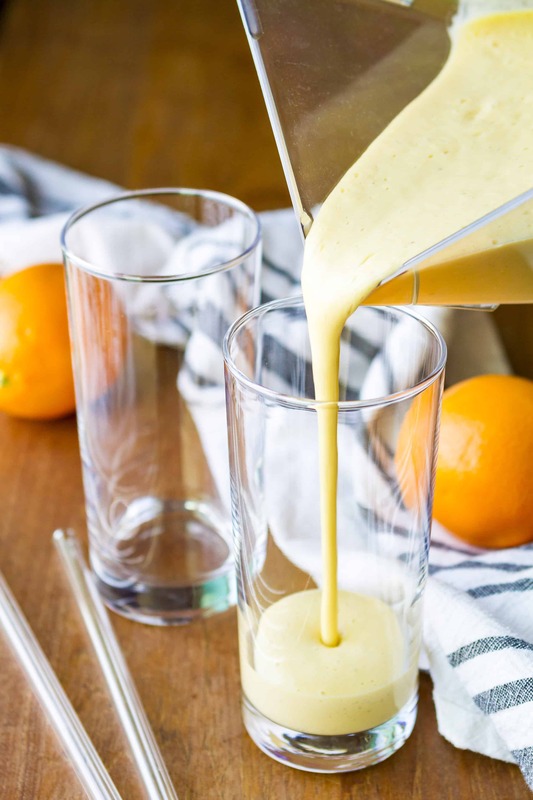 This healthy citrus smoothie recipe is packed with ingredients that will help keep your immune system in top shape for fighting cold and flu… Added bonus, it tastes AMAZING! This recipe was created in partnership with Simple Human, tools for efficient living. Thanks for supporting us and the brands we love! Each morning when I fire up my laptop, it feels like I’m bombarded with articles about the current flu pandemic. It’s no secret that this year’s flu season is the worst in nearly a decade, and experts are saying it hasn’t even peaked yet. Scary stuff! So you can bet I’m doing everything in my power to keep these nasties out of our home: common sense things like encouraging my kids to wash their hands more frequently, washing our bedding more often, making sure our humidifier stays at the recommended level, and wiping down remotes, phones, and other germy surfaces with antibacterial wipes regularly. And of course I’m encouraging my kids to up their Vitamin C intake by stocking our produce rack with fresh navel oranges and clementines. But you know what I’ve discovered? My kids are a bit lazy, and often peeling an orange just seems like too much work. I know, I know — I’m rolling my eyes too. 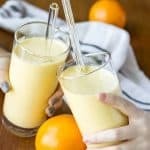 But rather than going against the grain, I’ve taken to serving them a healthy citrus smoothie each morning to pump their systems full of Vitamin C.
I LOVE this particular smoothie recipe because it can be made the night before and refrigerated until the next morning. I pour about two cups into these plastic freezer jars, making them a simple grab-and-go breakfast option. Oranges — Oranges are known for providing plenty of Vitamin C. I used two whole peeled navel oranges in this recipe for extra fiber. You can actually throw in whole unpeeled oranges for even more health benefits, but I really only recommend doing so if you’re using organic oranges. Mango — Did you know that mangos actually contain twice the daily recommended value of Vitamin C? They add natural sweetness to this smoothie, so you won’t find any added sugar in this recipe. I pick up the big bags of frozen mango chunks at Costco. They’re great for a healthy snack option, too! Bananas — I almost always add a frozen banana to my smoothies because they make them so deliciously creamy. They’re also great for extra energy and high in potassium (an electrolyte), making them ideal for active kids. Unsweetened Almond or Coconut Milk — Every smoothie needs some liquid for blending, and refrigerated almond or coconut milk are both good choices for adding some plant-based protein. Choose your favorite, just make sure to pick up the unsweetened variety. I’m loving this toasted coconut almond milk lately, it’s the best of both! Plain Greek Yogurt — I like to add Greek yogurt to smoothies for the probiotic benefits. I also pick up the big containers of this at Costco because it’s SO good with some chunks of thawed mango and chopped walnuts on top! Ground Ginger — Ginger is optional in this recipe, but it’s long been thought to have medicinal properties, and I personally like the bite it gives. I use the full two teaspoons, but my husband prefers less. And the kids don’t like it at all, so I just omit it for them. Try it and see what you think! Call me Type-A, but I HAVE to sip my smoothies through a straw. I’ve tried paper (blech) and stainless steel (my kids’ preference), but I always come back to these glass straws. We’ve shattered a few over the years, but they’re borosilicate, so the clean up is pretty minimal. 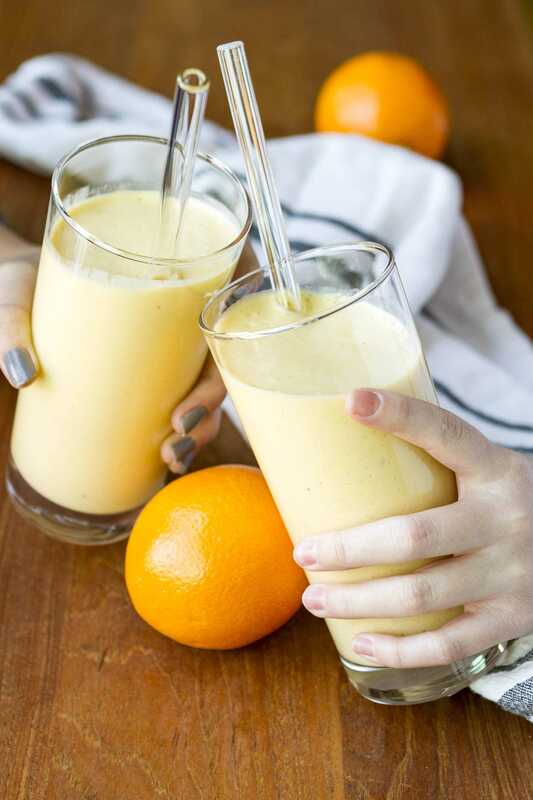 However you prefer to sip this tasty citrus smoothie, JUST DO IT! It’s become one of my favorite ways to start each morning. PIN IT NOW! 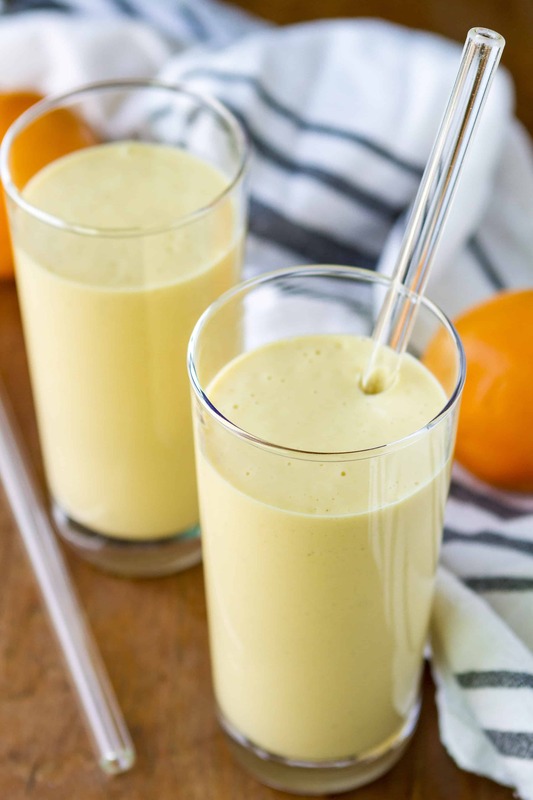 CLICK HERE TO ADD THIS HEALTHY CITRUS SMOOTHIE RECIPE TO YOUR SMOOTHIE RECIPES BOARD ON PINTEREST! Pour the almond or coconut milk into the blender jar, add the peeled oranges, and puree. Add the bananas, mango, yogurt, and ginger (if desired), and process until smooth. This recipe can be made ahead for an easy grab-and-go breakfast. Simply prepare the recipe the evening before and refrigerate overnight. I like to pour it into these plastic freezer jars. One batch fills up two of these jars — perfect with a small handful of walnuts in the morning! It’s truly become a kitchen staple that I could not live without. I mean, I literally walked up to the trash can in our bathroom the other day and said “Open can”, and then stood there dumbfounded when it didn’t move. Ladies, put this on your Mother’s Day wish list — you won’t be sorry! Speaking of hands-free, Simple Human also makes this rechargeable rechargeable soap pump. Fill it with your favorite soap, and the sensor allows it to dispense the perfect amount when you put your hands underneath — less if you hold your hands close to the nozzle and more if you hold them lower. I love that this means one less germ-covered item to disinfect, and it keeps germs from being spread around the kitchen. A single charge lasts about three months, and it recharges very quickly. If you’re looking for a slightly more upscale model for a bathroom, I recommend checking out this foaming soap pump gift set. The shiny chrome finish is SO pretty, and I’m seriously in love with the included NEST Fragrances grapefruit hand wash. It smells divine! But if grapefruit’s not your thing, Simple Human also offers a wide variety foam soap cartridges to refill it with. I have to tell you, the packaging for this gift set is SO gorgeous — it would make a fabulous gift idea! I’m thinking housewarming, weddings, Mother’s Day, etc. Last, but not least, is this sweet little sink caddy. It does double duty by keeping my sink area more organized and giving my sponges and dish brush ample room to dry out between uses. It’s small but mighty! What are YOUR favorite tips for keeping germs at bay during this awful flu season? I’d love to see how your healthy citrus smoothies turn out… Tag me @Unsophisticook on Instagram or use the hashtag #Unsophisticook so I can check them out. Enjoy!